rating: 5/5 [in the genre] or 7/10 [all books I’ve ever read]. recommended for: Fans of Jeannine Garsee's The Unquiet, Kendare Blake's Anna Dressed in Blood, and Supernatural. People looking for likable characters and good psychological horror. Her eyes saved his life. Her dreams released his darkness. After four years of sleeplessness, high school junior Parker Chipp can't take much more. Every night, instead of sleeping, he enters the dreams of the last person he's made eye contact with. If he doesn't sleep soon, Parker will die. Then he meets Mia. Her dreams, calm and beautifully uncomplicated, allow him blissful rest that is utterly addictive. But what starts out as a chance meeting turns into an obsession; Parker's furious desire for what he needs pushes him to extremes he never thought he'd go. And when someone begins to terrorizing Mia with twisted death threats, Parker's memory blackouts leave him doubting his own innocence. Finally, the book I've been looking for! It's a rare book I just can't put down, and I finished this one in a day and change. It's what I wanted The Asylum by Madeline Roux to be. Once you get through the slowish start, it races to the end, taking twists and turns that I never expected. Parker is immediately likable (even when I wanted to slap him) and his voice adds a snarky, unique tone to the narrative. His incredible power is a talent that many people crave, but Johansson adds a dark twist that makes it nightmarish. Add a mystery stalker and Parker's world becomes a dark race against time, with no easy way out. I loved that even though the plot is breakneck, it doesn't sacrifice the characters. Even the side characters feel as deep and real as Parker, and I loved that they were real friends that didn't disappear when "neat new person" Mia came to town. And her role? Not what I expected, which made it even better. I thought the ending was a bit of a cop-out, but not enough to knock it down a star. This was an exciting, well-paced, tightly written book that could stand well alone--but if you read it and aren't dying for the sequel, I'll be surprised. It took me a little bit to get into. I was kind of afraid, considering how much I'd looked forward to this book. The slowness didn't last long. Once I was oriented to the dream lore and Parker's life, and once Mia really became central, I was hooked in the mystery. On one hand, you have Parker's race against the clock. If he doesn't sleep, he'll die. But saving himself may require sacrificing others. Not to mention something dark is happening to Mia, and Parker has no idea if he's a part of it. The tension between Parker's desperation to save himself and his longing to save his friends not only makes him feel real, but it keeps the plot strong through the whole book. I was never sure which Parker would choose, or whether he would ultimately find himself to be innocent or guilty. Like I said, the end was a little too easy. I wasn't sure it was set up enough, and I kind of wanted it to go the other way. However, I liked that not everything was roses in the end. It left a lot open for a sequel, and also made the consequences of Parker's decisions more real. All in all, it was well done. Parker's friends play a much bigger role than most friend characters do, which was refreshing. There's also a touch of absolutely breathtaking romance, murder, and mystery. What more could you want? I've never read anything like this before. Dreamwalkers aren't a new concept, but the way Johansson writes it is fresh. Being able to see dreams is Parker's living nightmare. He can never sleep, never dream, never escape from the secret thoughts of others. And if he doesn't sleep, his brain will go first, and then his body. The many layers of reality--dream, waking, hallucination--keep you on your toes, never quite knowing what's real and what's imagined. There are a few holes (hem, four years without real sleep and you're still alive?) but suspend a touch of disbelief and it doesn't matter. Where young adult horror is concerned, this goes way beyond your typical slasher. The characters were so good that they made up for the few holes I saw. Parker is a complex, endearing narrator. He's snarky, sincere, and flawed in real, dangerous ways. He can be foolhardy and selfish. His flaws get him into a lot of trouble and take the plot in new directions. But he has such love for his friends that I could forgive him a lot. Then there's Finn, his best friend, who's quirky, silly, and loyal--but doesn't let Parker get away with any crap, either. Addie was possibly my favorite. Unlike your typical girl sidekick, she's there for the hero, but she's going to make sure her own needs are met too. She's fierce, smart, and uncompromising. And in a way, she saves the day as much as Parker does. Mia is a little less fleshed out than I'd like, but that's part of her character, too. She's closed-off, so we don't get to know her as well. Even so, she plays a damsel in distress who's terrified and hunted, but still desperate to fight her own battles. When I dog-ear a bunch of pages, it's a good sign. There were a bunch in this one. Parker's voice is just so clever. It's parts lyrical, parts sardonic. I laughed a lot at his internal monologue and his banter with his friends. It's part of what gives him dimension. There are also some beautiful metaphors and a romantic scene that gave me chills. I look forward to seeing Johansson's writing mature even more in the next book. Like I said, the pacing was a little off in the beginning, but it picked up quickly. I liked that there were some common threads and motifs sprinkled through, and the dialogue was so much more believable than a lot of young adult books. I could totally buy them as teenagers. 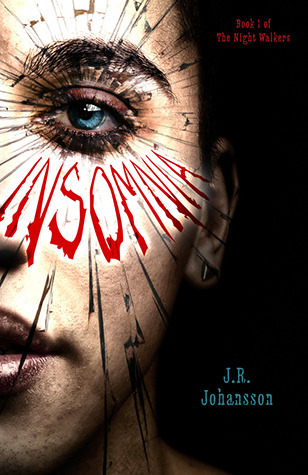 Young adult horror that takes on the blurred lines between reality and dreaming, sanity and madness, with a lovable cast and a plot that keeps you guessing. I haven't read a good horror type book in a while, and this one looks different from many other YA choices - I may just have to pick it up! Pick it up! It was so fantastic. It's very psychological horror, if you like that, and the fantasy element just added even more layers. I've read bad reviews for this book. I'm planning to read it but when it goes on sale on Amazon. I actually haven't seen another review yet. I'm curious to see what other people didn't like about it. Hopefully you'll enjoy it as much as I did!